Alternative reconstructions of the Battle of Dunnichen [Nechtansmere]. Guy Halsall. 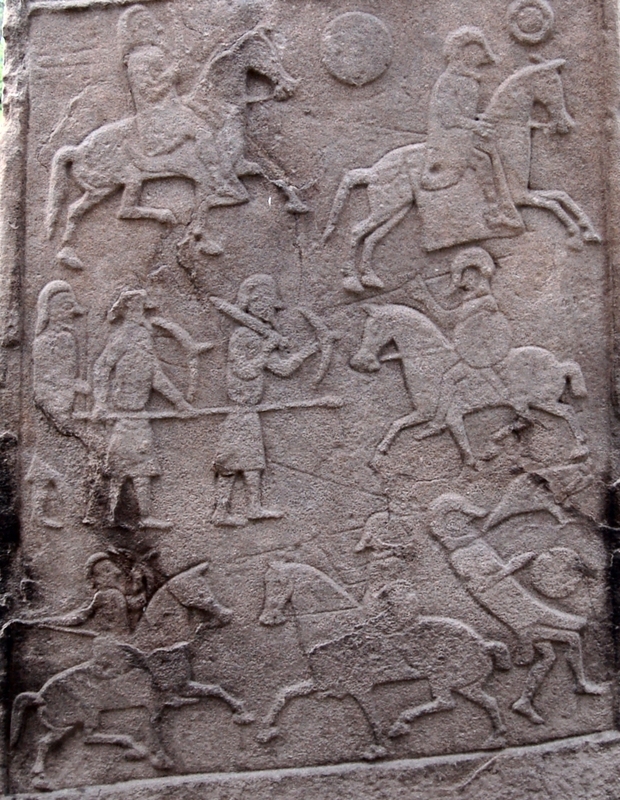 If we accept that the Aberlemno Stone as an accurate portrayal of the fighting men of Dunnichen [Nechtansmere], then it should contain clues to the battle. Its most surprising revelation is that at least some of Ecgfrith’s men fought on horseback. This turns on its head the traditional view that, while the Saxons might ride to the battlefield, they always fought on foot. This tradition may however date from later times when the bulk of Saxon armies were made up of the fyrd, county levies who in most cases would not have been able to afford to own a war-horse. Judging from Stephan’s account of the Two Rivers campaign, Ecgfrith’s northern expeditions were well-mounted and presumably capable of fighting on horseback when the occasion demanded. Was Dunnichen, then, a cavalry charge against infantry? The stone certainly gives a sense of horses galloping towards the enemy, and of the foot-soldiers braced to resist with spears or pikes, much as the men of Robert the Bruce did at Bannockburn. Bridei evidently had horsemen of his own which, to judge from the final scene on the stone, he kept back for a perhaps decisive sortie once the English efforts to break the line ran out of steam. The Battle of Dunnichen was not one of those battles that went on all day. According to the anonymous monk of Lindisfarne, it began at the ninth hour, that is, at three o’clock in the afternoon (the remarkable precision about the time suggests that our monk had heard it from an eye-witness). Perhaps Ecgfrith had staked the outcome on a glorious charge straight at the enemy. More likely, as an intelligent if impetuous king, he would have tried hit-and-run tactics that worked so well for Duke William at Hastings. Probably he was overcome by sheer force of numbers. A timely sortie from Bridei’s horse might have hemmed the English in at the bottom of the hill on their exhausted mounts. Floundering in the mud by the lake- side, the king ‘and a great part of his soldiers’ were cut down one by one by Bridei’s lightly armed militia. Ecgfrith was probably among the last to fall, his bodyguard lying dead around him, true to their oaths. Not all the English were slain. Some were captured and taken into servitude, and at least a few escaped and returned to England. St Cuthbert, then at Carlisle, heard of ‘the woeful disaster’ within a few days. Given the likely odds, one might wonder why Ecgfrith accepted battle, when, with his mounted equitates, he might easily have made a tactical retreat. The rivalry between Britons and Angles began soon after the Romans left. British Celtic tribes had occupied the greater part of the territory between the Forth-Clyde line and Hadrian’s Wall— today’s Lowlands. Some of them, notably the Votadini, had had ties with the Romans, had intermarried and taken Romanized names. The Votadini had their capital on Traprain Law, in East Lothian, a formidable hill-fort and settlement of Bronze Age origin that remained in Celtic hands all through the Roman period. In these districts the Britons lived in villages or groups of buildings, surrounded by wooden palisades. Here and there stone was used for walls, or split to make tiles in place of thatch for their roofs. Generally, one house was markedly larger than the others, and this has been taken to suggest that some kind of manorial system was operating, where a local landlord had sway over the rest of the people. When the Romans abandoned Hadrian’s Wall, the Britons found themselves sandwiched between the fiery Picts in the north and the Angles and Saxons from the south. Gradually they were eased out of Lothian altogether as the Angles crept towards the Forth. They moved to the west, south-west and into Cumbria and Lancashire where they received support from their kinsfolk there and in Wales. But they were cut off from their Welsh compatriots by the crushing victory of the Anglian king Aethelfrith at Chester in 613. The same king had a decade earlier defeated the Scots of Dalriada under King Aidan at Degsastan (probably Dawston in Liddesdale). Aidan had been marching down to the aid of the Britons in Cumbria when he was intercepted and beaten in the field. These two victories isolated the Britons and in the later part of the century more Angles advanced into south-west Scotland and took the British base at Dumbarton. Yet the Britons survived these blows, and the kingdom of Strathclyde (as it was known) continued to exist, with ever changing boundaries, right into the eleventh century. The Angles were Germanic in origin and came principally from north-west Germany and Denmark, and a few even from Scandinavia. They had been raiding the east coast of Britain for years, but until the Romans left they had not succeeded in settling. After about 500 they started to make firm settlements. Some came to Lincolnshire, and some to Norfolk and Suffolk (which are still known as East Anglia). Their main base of settlement, so far as this story is concerned, was north of the Humber, in Yorkshire, Durham and Northumberland. They founded two kingdoms, Deira and Bernicia. The first stretched from the Humber up to the Tees and the second from the Tees to the Firth of Forth. To begin with, the Angles moved upwards by sea from the Humber in boats rather than trudging across the Yorkshire Dales and coping with the wild and wind-swept Northumberland hills. They founded towns along the coast. One was Bamburgh, built by their king Ida in about 550. 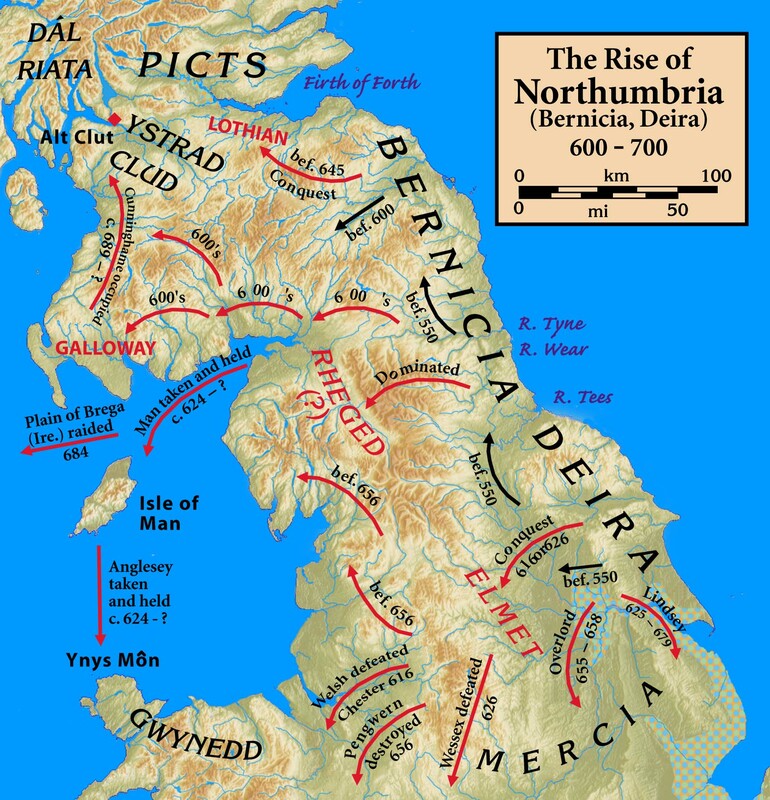 One of his grandsons was Aethelfrith, king of Bernicia from 593 to 617. He was that Aethelfrith who beat the Scots at Degsastan and the Britons at Chester. He also dispossessed his neighbour King Edwin of the throne of Deira and ruled both. For the next half-century there was rivalry between the two Anglian kingdoms, and this relieved the pressure on the Scots. It is interesting that despite defeating the Scots at Degsastan the Angles made no attempt to invade Dalriada. But they did cross the Forth and intrude upon Pictish territory. 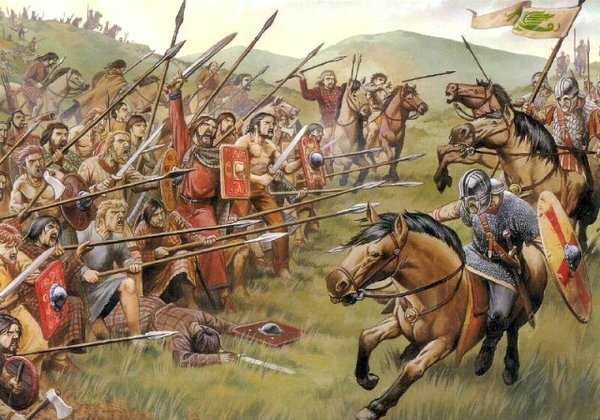 In 685, however, the reckoning came when at Nechtansmere (near the present town of Dunnichen in Angus) Aethelfrith’s grandson Ecgfrith, king of the Angles, was defeated and slain in a crushing and decisive Pictish victory. As the Anglo Saxon Chronicle admitted, the king was slain ‘and a great host with him’. The victorious Pict chief was Brude, and he may have been a descendant of another Pict leader, also called Brude, who had welcomed St Columba in the sixth century. 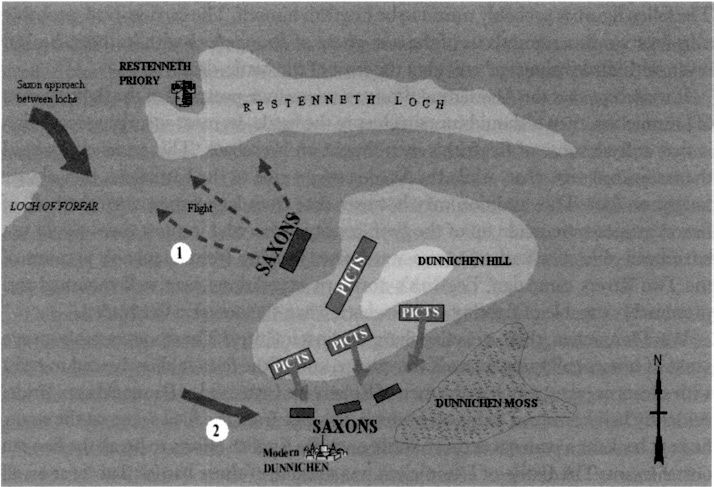 Nechtansmere is one of the most important battles in all Scottish history. So great was the defeat of the Angles that they had to give up all further attempts to move deeper into Pict territory. As Bede wrote in his History, ‘their kingdom thereafter had narrower bounds’. When the battle was being fought it is unlikely that either side view it as more than a simple trial of strength. Naturally, the Picts were resolved to stop further encroachment upon their lands. Those Anglian leaders who survived must have thought it best to settle for what they had achieved so far, and that was the territory between the Forth and Hadrian’s Wall. But what it did mean was that Scotland was not to become an extension of England. It was a major check on English ambitions north of Lothian. If the victory had gone to the Angles, there might never have been a Scotland at all. The Picts were the only one of the four peoples of Scotland to keep their territories more or less intact during these turbulent years. It is likely that for some of the time they were divided into two kingdoms, northern Pictland and southern Pictland. There had been a king with a capital at Inverness in the sixth century, in St Columba’s time. But the differences would have been of a military kind. Perhaps the southern Picts had leaders who refused to accept the sovereignty of the northern Picts. Certainly, towards the end of the seventh century, the power centre had shifted towards the north-east. And in the middle of the eighth century the southern Picts had another powerful ruler, Angus MacFergus, who apparently was able to bend the Dalriadan kings to his will.